Densely layered and quite substantial in the mouth, this wine delivers generous blackberry and black currant fruit, wrapped around a vibrant core of acidity which keeps the wine pert and lively on the palate. With Valentine’s Day just around the corner, we’re all on the hunt for that perfectly romantic bottle to share with our significant other. 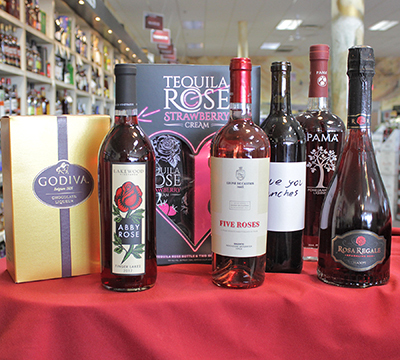 Rather than reaching for your usual weeknight vino, take the romance up a notch by choosing from one of these romantically themed bottles to set the mood. Light some candles, pop the cork, and get to sipping, because nothing says “I love you” quite like a bottle of wine. Strawberry and watermelon tones carry the nose and palate, with Mediterranean shrubs in the background. Medium in weight, with a nice balance of acidity, cranberry-skin tannins offer support from start to finish. A soft red sparkling wine made from Brachetto. This extremely aromatic, complex and historical grape variety grows only in the area of Acqui Terme in Southern Piedmont. Aromatic with hints of raspberries, strawberries and rose petals. Flavors of fresh raspberries, with crisp acidity, enticing the palate with an initial softness, graduating to a clean and dry finish. Ultra-velvety dark taste is awe-inspiring, its balance not excessively sweet. The brilliance of the most decadent chocolate you can imagine made heavenly as an extravagant liqueur. They start with the world's most luxurious chocolate, then marry it with some of the world's most enticing flavors, so every single drop of Godiva is pure indulgence. 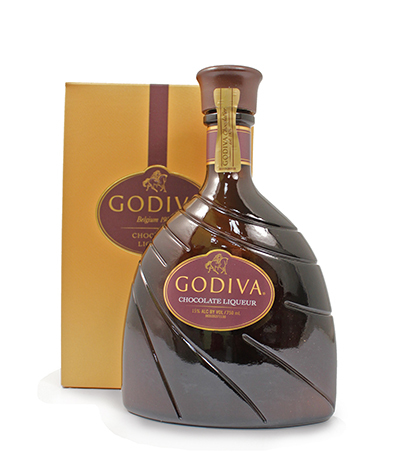 Whether it's on ice or ice cream, in coffee or in a creative cocktail, the irresistible richness of Godiva Liqueur is unmistakable and adds a bit of heaven to everything it touches. 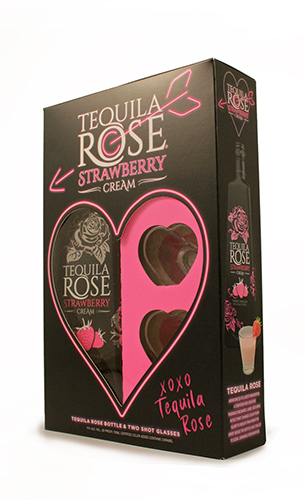 Tequila Rose is a Mexican cream liqueur. It is a mixture of strawberry cream liqueur and tequila. The tequila is very subtle and really only gives a spirit flavor to the liqueur. The strawberry and cream flavors are dominate and this tastes more like a strawberry milkshake than a tequila-based liqueur. This Riesling is vibrant and aromatic, featuring the distinctive minerality that has become the trademark of the Finger Lakes. Fragrant essence of spring blossoms sets the stage for a succulent palate of early fruit, balanced with a refreshing crispness, revealing the true qualities of the Riesling grape. A brilliant texture carries into a lingering finish, in a wine that accommodates a wide range of food. This wine bursts from the glass with a pure and expressive bouquet of red plums, raspberries, rose hips and spice. On the palate, it's medium-bodied, supple and velvety, with an expansively textural attack, melting tannins, and succulent, mouthwatering acids. It's an elegant and flavorful Pinot Noir. Bob Bates and Christopher Bates, Master Sommelier, founded Element Winery in 2005. Together they have learned the ups and downs of wine making, and forged a recognizable style of wines. 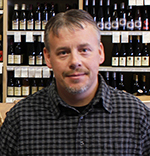 Christopher left the winery in Spring of 2014, and now Bob is a full time winemaker. "Our goal is to guide the wine to be what it is capable of, not forcing it to be what we want it to be. To this end, we work hard to not craft the wines to an image, but rather allow the wine to be itself, and to allow the impacts of our region shine." "We believe in making wines that are true to place. 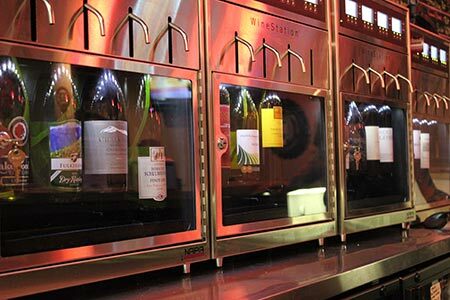 To this end, we do not remove things from our wines (Reverse Osmosis, Spinning Cones, etc). 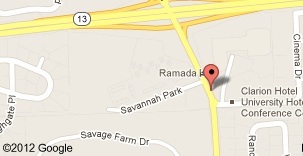 More importantly, we don’t add much either. With the exception of minimal amounts of sulfur, we don’t add anything to our wines. We do not want to force the wine." Their tasting room is located in downtown Geneva at F.L.X. Provisions. 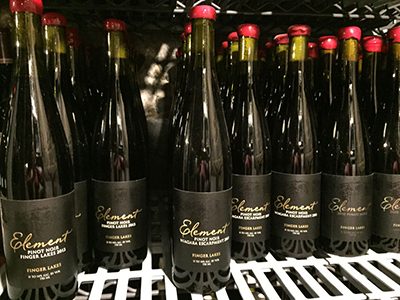 The aromas of Element Pinot Noir, are explosive, and burst forward with heirloom rose and violets, ripe cherry, raspberry and red plum. The wine has powdered mineral, black tea, and sweet spice aromas with no oak influence. The wine is medium in body with medium plus acid, medium minus tannins, and medium alcohol and the finish has a core of sweetness from the ripe fruit notes.